Equine Guelph’s interactive display, EquiMania!, entertained and educated large crowds of young horse lovers at the Can-Am All Breeds Equine Emporium in London. March 19 – 21. The equine expo packed in spectators eager to shop at the trade show, watch the entertainment and take in world renowned clinicians. With so much to explore in EquiMania! ; kids were returning often throughout the day to play the “Danger Detective” game, braid tails, wrap legs, create crafts and many more activities including learning about how the inside of a horse functions. Many adults were just as fascinated by the award winning displays including a new addition illustrating to horse owners the importance of water to aid in the digestion of fiber. Simulated tubes gave a vivid demonstration of how food travels through the intestines. One father was towed back to EquiMania! at the end of the day so his 6 year old son could sit once more upon “Shorty Legs”, which he announced was his favorite part of the whole day! Another EquiMania! visitor, Amanda Marshall from popular TV series, Heartland also enjoyed a turn in the saddle. 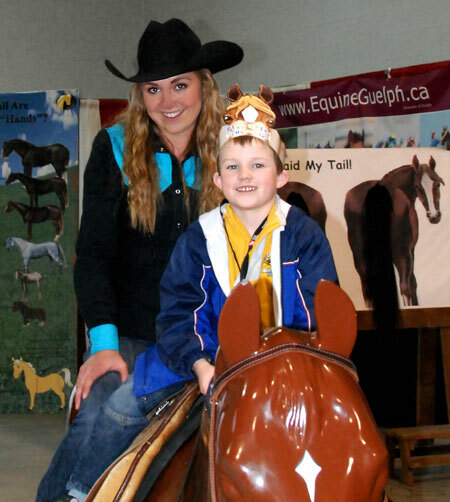 Equine Guelph congratulates Bucas Blanket winner: Maureen Dougan of London, Ontario. Those entering the draw signed up to receive Equine Guelph’s bimonthly E-news informing horse enthusiasts of upcoming events and workshops. 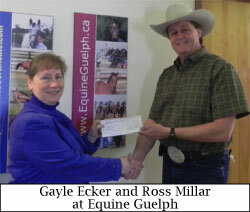 One can also sign up on-line at www.EquineGuelph.ca. EquiMania! and Equine Guelph will appear next at the premier of Canada’s Outdoor Equine Expo at University of Guelph’s Arkell Research Station in Guelph, ON from June 4-7. From there, EquiMania! will travel to Kentucky for the Alltech FEI World Equestrian Games, September 25 to October 10. To All Our 2010 EquiMania! Sponsors we say Thank You.